We all know that crafting a killer low-end is one of the most important - yet often troublesome - aspects of creating modern productions. Whether you're after a chest-rattling sub, a slick funk line or a club-ready sequenced synth bass, you'll find things much easier with a proper understanding of the studio science, tools and techniques involved. 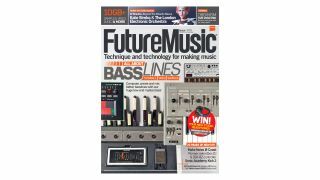 In this issue's massive cover feature we're running through exactly that; covering all the essential know-how you need to compose, craft and mix killer basslines, and breaking down some classic bass sounds on video along the way. In Print: Find your nearest UK stockist or order your copy direct from us! Subscribe to Future Music and save up to 46%! Hardware Arps - Classic driving synth melodies and rhythmic loops, fine-tuned to give your tracks that old-school arpeggiator feel. Majestic Bells & Mallets - Mallet-style hits and loops, treated with subtle EQ, filtering and various reverbs for maximum impact. PLUS: Updated this issue! Access the FM sample archive - Download the 'Archive' packs and get over 8GB of loops, hits and instruments from our back catalogue of high-quality and royalty-free samples. From vintage synths and drum machines to esoteric instruments and FX - think of it as our best of. All the samples you need to create great music!